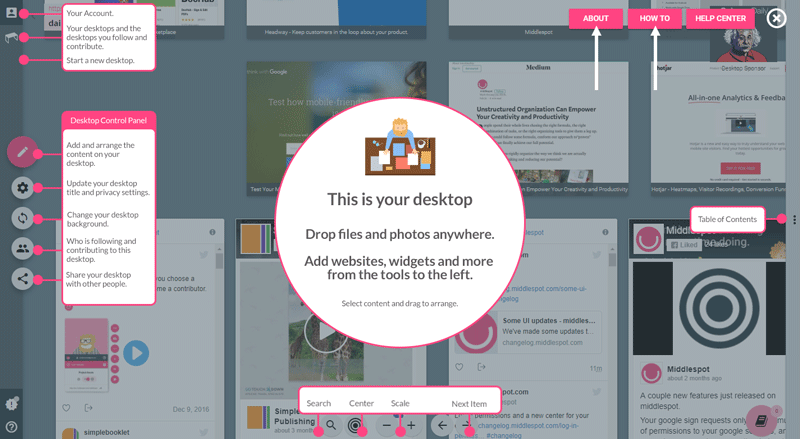 We've made some updates to the interface of middlespot to reduce the amount of buttons and make the focus more on your content. The desktop icon has been changed to an actual desk and the create a new desktop has been moved into the desktop folder. 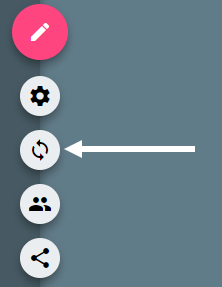 This reduced the number of icons on your interface by one. Also, since creating a desktop is not something done all the time, it makes it less distracting by moving it into your desktops menu. We've moved the sync button from under the title and URL of the desktop to the control panel toolbar along the left of the interface. This makes it more integrated with the tools that affect the desktop you have open. Since you don't update your desktop background very often, we figured it would be better placed in your settings menu, instead of an additional distraction in your primary desktop control panel. We removed the about button from the information buttons in the bottom left corner. It is now found as a secondary button in the help screens. Its just another opportunity to remove another secondary button from the desktop interface.